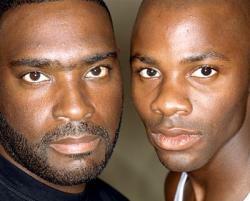 The real Antwone Fisher poses with Derek Luke, the actor who portrays him in the film. There are many aspects of Antwone Fisher that are familiar from other movies. Good Will Hunting, Ordinary People and The Prince of Tides all have the protagonist dealing with their past through the help of a psychiatrist; all of them are directed and/or written by actors as well. Denzel Washington's direction is simple and old-fashioned, in other words it doesn't get in the way of the story being told. When the movie begins Antwone Fisher is dreaming. He sees himself as a child at the head of a table leaden with delicious food and surrounded by a large and welcoming family gathered to have a feast. This idyllic image is shattered by a gunshot and he awakens in a sweat. He is a sailor in the US Navy, a sailor with a problem. He keeps getting into unprovoked fights with his comrades. Finally, faced with dealing with his problems through the assistance of the company shrink or getting discharged, Antwone decides to open up. What he reveals is a past filled with horrific abuse and neglect. Antwone was born in prison where his mother was serving time. He spent his childhood in a foster home run by an evil woman, who emotionally and physically abused him. If these details sound like clichés, that's because they are, but with one important difference, they're true. 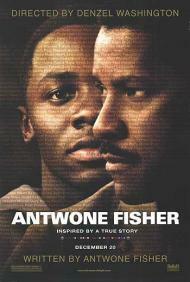 The real Antwone Fisher worked as a security guard at Sony pictures. Like many people in Hollywood, he had a story to tell. Unlike many people in Hollywood his story is actually entertaining. Although he tends to make himself perhaps a bit too perfect, the performance by newcomer Derek Luke keeps the role from going over the edge. Make no mistake; this is an inspirational movie with a capital I. From beginning to end it is trying to create a strong emotional reaction in the viewer. So although there are no big surprises, fortunately Antwone Fisher is such a likable guy who was so clearly mistreated that it is incredibly easy to care about him and to root for his success. There was much sniffling going on around me in the theatre, and I'm man enough to admit some of it was coming from me. 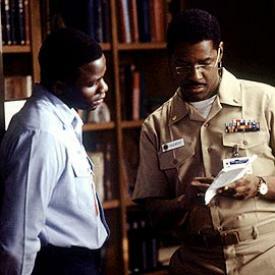 Derek Luke and Denzel Washington in Antwone Fisher. I was not moved to tears by this movie but I did find myself liking and caring about Antwone. He was raised without love and respect yet his story generates it in spades. The irony is that perhaps the abuse and neglect actually ended up making him into a pretty amazing person. Early in the movie Fisher has a paper thin defense mechanism. It is his temper. Underneath this facade is a very cerebral, sensitive young man searching for his place in life. A psychiatrist becomes his foster father and Fisher in return becomes his foster son. Their relationship is the catalyst that changes Fisher's life. Patrick points out the one flaw that I likewise found with this film. Antwone Fisher is a saint. So he has a bit of a temper. The movie spends two hours excusing it. It was like watching James Dean in Rebel Without a Cause. Sure he is considered a trouble maker, but underneath the surface he is just a young man looking for acceptance and love. Although not a perfect story, it is still a good one. Through Luke's performance I felt that I could relate to Fisher. I also joined the navy to escape my life. My problems were not as dramatic as his, but I felt a connection to him nonetheless.